We’d love your help. Let us know what’s wrong with this preview of Nuclear 2.0 by Mark Lynas. To ask other readers questions about Nuclear 2.0, please sign up. Oh boy....they say you should never talk politics or religion in company if you want to avoid a fight. Well, if you add global warming and the environment to that list then the fight can go nuclear. And that's why Mark Lynas has written this book. As a former anti-nuclear campaigner he tries to defuse the issue and allow a relatively calm debate about the contribution nuclear power generation can make to protecting the future of the globe. By now, 99.9% of people reading this will have come down Oh boy....they say you should never talk politics or religion in company if you want to avoid a fight. Well, if you add global warming and the environment to that list then the fight can go nuclear. And that's why Mark Lynas has written this book. As a former anti-nuclear campaigner he tries to defuse the issue and allow a relatively calm debate about the contribution nuclear power generation can make to protecting the future of the globe. By now, 99.9% of people reading this will have come down on one side or other of the nuclear debate and the "antis" won't want to read another word. How wrong they might be. I don't know of any issue which excites so much debate with so little hard fact, than nuclear power. But take the time to read this short and clear book. And then take another few minutes to test your own prejudices against the pro-nuclear argument. Mark Lynas, in "Nuclear 2.0", commits the same errors he ascribes to the anti-nuclear movement, except that where anti-nuclear activists allegedly exaggerate, Mark Lynas relentlessly minimises. Lynas quotes UNSCEAR and others in an effort at scientific respectability, but the quotes are often selective and misleading. For example, re Chernobyl, UNSCEAR is correctly quoted as offering reassurance to individuals that the personal risks are low, but there is no mention whatever that UNSCEAR also cle Mark Lynas, in "Nuclear 2.0", commits the same errors he ascribes to the anti-nuclear movement, except that where anti-nuclear activists allegedly exaggerate, Mark Lynas relentlessly minimises. Lynas quotes UNSCEAR and others in an effort at scientific respectability, but the quotes are often selective and misleading. For example, re Chernobyl, UNSCEAR is correctly quoted as offering reassurance to individuals that the personal risks are low, but there is no mention whatever that UNSCEAR also clearly states "Although the numbers of cancers projected to be induced by radiation exposure from the accident are very small relative to the baseline cancer risk, THEY COULD POTENTIALLY BE SUBSTANTIAL IN ABSOLUTE TERMS" (my emphasis - even a "very small" increase of say, 0.5%, in baseline risk would cause, say, 10,000 extra cancers in a 10 million population, assuming normal cancer mortality of 20% of all deaths). There is no mention that earlier UNSCEAR reports put the eventual excess cancer death toll among the cleanup workers at 4,000, and in the most affected areas of Russia, Ukraine and Belarus alone at a further 5,000. And the harm is unlikely to stop there. A possible body count of 9,000 (from the most affected areas alone), cited by the very agency - UNSCEAR - that Lynas is using to establish credibility, is surely worth at least a mention, especially from someone claiming scientific objectivity. Similarly, Lynas mentions UNSCEAR's recent warning that collective dose should not be used to estimate future cancer deaths at Fukushima, without mentioning that the ICRP, and UNSCEAR itself, and many other scientifically reputable government agencies, have previously all used collective dose to estimate cancer deaths, or that ICRP and UNSCEAR are not saying NO deaths, they are warning of uncertainty at very low doses. Re hormesis or a low dose threshold, both UNSCEAR and the ICRP have carefully examined the evidence, and have firmly rejected them in favour of LNT. The LNT "debate" is bogus. At every turn of the debate, Lynas presents the view that makes nuclear look best. This may be a suitable approach for a propagandist, but one can hardly simultaneously wrap oneself in the science flag. Re a mythical 100mSV limit, Lynas, in the teeth of the growing evidence, fights a rearguard action to cast doubt everywhere except on the pro-nuclear position. However, as far back as 2001, the ICRP, in "Radiation and Your Patient: A Guide for Medical Practitioners" advised doctors that "The higher dose diagnostic medical procedures (such a CT scan of the abdomen or pelvis) yield an effective dose of about 10 mSv. If there were a large population in which every person had 1 such scan, the theoretical lifetime risk of radiation induced fatal cancer would be about 1 in 2,000 (0.05%)." So why is the evidence sufficient for patients exposed to 10 mSV (NB 10 mSV, not the 100 mSv claimed by Mark Lynas as some kind of threshold) to be warned of a 1 in 2,000 risk of fatal cancer, but not sufficient to clearly warn "a large population", exposed to similar radiation levels from a nuclear disaster, of similar risks, instead of burying such risks in specious technobabble about "insignificant" increases in the baseline cancer rate/"no health effects will be detected" (while admitting quietly that thousands or tens of thousands may actually die)? Why are the risks from 10mSv enough to warn doctors and patients, but, according - sometimes - to UNSCEAR and the ICRP, not enough to even estimate, not even roughly estimate, overall cancer deaths from Chernobyl and Fukushima? Could it be that such clear, direct estimates give embarrassingly large - to the nuclear industry - estimates of 30,000 fatal Chernobyl cancers and 1,000 - 3,000 fatal cancers from Fukushima? Could this just possibly have some bearing? Lastly, Lynas gets his sums badly wrong. In a bungled attempt to discredit LNT, he quotes figures from Preston et al (2004) "Effect of recent changes in atomic bomb survivor dosimetry on cancer mortality risk estimates", Table 3. He claims "......those receiving doses below 100 mSv had no observable increase in risk at all. Out of the 68,467 people in the below 100 mSv category, 7,657 died of cancer before 2000, out of an expected number of cancer deaths totalling 7,655. The difference* is too tiny to have any statistical meaning. This latter conclusion is critically important. No convincing evidence has ever been obtained, despite many hundreds of studies, showing a statistically significant correlation between cancer incidence and radiation exposures of less than 100 mSv. " (* Difference is 2). There are actually other widely accepted studies showing excess cancer risk at doses well below 100mSv, from Alice Stewart's work, from studies of radiation workers, from CT scans, even from background radiation studies, but forget about them. Just look up Table 3 yourself. (You'll have to register - free - at http://www.jstor.org/ ). It shows cancer deaths roughly as predicted by LNT in various dose bands from 2,000 mSv down. It does show only 2* fitted excess cancer deaths in a lower category, but it's in the below 5 mSv (FIVE mSv, not 100 mSv) category, and it shows fitted excess cancer deaths in the 5-100 mSv category to be 44. These 44 sub-100mSv deaths have simply disappeared in Lynas's account. It's easy to draw "critically important" conclusions when you lose statistics that don't suit. But don't get caught. The only downside to this book is the fact that it is only 80 pages - short. But even for someone like me who knows a lot about nuclear power it was a great read. Mark Lynas is such a great and informative writer that I am going to read all of his books. I like writers who stick to facts and statistics, and Mark Lynas does just that. An important message: we need nuclear power to avoid the worst consequences of climate change. Nuclear and renewables should not compete with each other, but collaborate to drive out coal. Nuclear is safe, clean, and possible. This book is a good, well argued, reminder for those who already agree and hopefully an eye opener for those who don't (yet). Well written and concise tale of the author's mindset at he made a pivot on the issue of nuclear energy. To be clear he is still against the use of nuclear weapons, but what better way to dispose of warheads than down blending them into fuel for civilian electrical grids? This might not be considered an in depth book, but it covers a variety of issues and has 15 pages of notes which allows the reader to thoroughly follow-up on any chapter which might pique their interest. There are a very few ite Well written and concise tale of the author's mindset at he made a pivot on the issue of nuclear energy. To be clear he is still against the use of nuclear weapons, but what better way to dispose of warheads than down blending them into fuel for civilian electrical grids? Short and simple. Good info and makes a strong nuclear case, but not much of a book. “Nuclear 2.0" makes the compelling case that in order to resolve the global warming crisis; nuclear power must complement other low-carbon power sources. 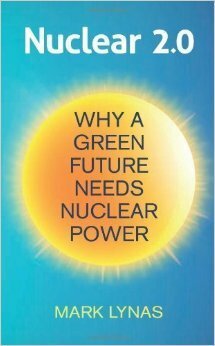 Environmentalist, Mark Lynas provides the readers with a succinct, accessible book that makes the strong case for nuclear power. Time and scientific evidence has converted the author from the anti-nuclear camp to a pro-renewable and pro-nuclear outlook. This stimulating 71-page includes the following unnumbered chapters: The Carbon Bomb, The Rise of the Rest, Coal reality, Fossil fantasies, The carbon challenge, Renewables revolution, Energetic denialism, Breaking the nuclear taboo, Nuclear and the environment, The anti-nuclear movement, A world safe for coal, Nuclear accidents, Fukushima health impacts, Radiation and reality, Chernobyl, Deaths per Terawatt-hour, The German Experiment, Next-generation: Nuclear 2.0, Too expensive? Solving climate change, and All of the Above. 1. Well-researched, accessible and succinct book. 2. A very important topic handled with utmost care and deference. Lynas does a good job of avoiding falling into the proverbial alarmist well. 4. Makes the compelling case that maintaining an anti-nuclear ideology is both ill-conceived and fundamentally incompatible with resolving the climate change crisis. 5. While a lot of books of this ilk spend a lot of time on demonstrating the reality of global warming this one focuses more on how to address it through the use of nuclear power. 8. Complementing nuclear power with other sources of renewable energy (solar and wind). 9. Making clear what he does not support and why. 11. Putting two of the most significant nuclear accidents in perspective (Chernobyl in 1986 and Fukushima in 2011). The health impacts. 13. The evolution of nuclear reactors. Improved standards of safety. 1. Charts and graphs would have added value. 2. The author makes a compelling case for nuclear power but doesn’t really delve into the question of whether or not we have the will as a planet to properly address it. 3. Footnotes are not properly linked. 4. The author mentions several books but there is no formal bibliography. In summary, the author makes a succinct compelling case for nuclear power. Mark Lynas makes it perfectly clear that he is not against renewables; his main point is that it will require much more than solar and wind to supply enough power to a rapidly-growing globe and address climate change simultaneously. The case is irrefutable; it’s a matter of whether or not we humans can address the issue of global warming in a timely and effective manner. Will we build enough nuclear power plants to properly address our increasing global demand in the best interest of our planet? A great Kindle value, I highly recommend it! Formerly an anti-nuclear campaigner and writer, Lynas lays out the reasons for his conversion to the (very sensible) view that nuclear power is absolutely vital, along with a massive increase in use of renewables, to what looks like an increasingly hopeless aim of saving the planet from being cooked by carbon. Making his case in short, fully referenced chapters, this little book is fascinating. On finishing it, I was more certain than ever that the world's media-fed fear of nuclear energy is disa Formerly an anti-nuclear campaigner and writer, Lynas lays out the reasons for his conversion to the (very sensible) view that nuclear power is absolutely vital, along with a massive increase in use of renewables, to what looks like an increasingly hopeless aim of saving the planet from being cooked by carbon. Making his case in short, fully referenced chapters, this little book is fascinating. On finishing it, I was more certain than ever that the world's media-fed fear of nuclear energy is disastrous for the future of the planet. Lynas' words are extremely convincing. However, the man himself is less so. As a non-specialist, seeing reviews that rubbish his sums and accuse him of leaving out important information is a little troubling. But even more damagingly, Lynas' own past raises more than a few questions. Yes, obviously people can and should change their minds when faced with evidence but consider Lynas' own words on his belated conversion to a more grown-up and sensible position on GMOs. In 2013 he apologised for vandalising field trials and admitted "... in 2008, I was still penning screeds in the Guardian attacking the science of GM – even though I had done no academic research on the topic, and had a pretty limited personal understanding. I don’t think I’d ever read a peer-reviewed paper on biotechnology or plant science..."
That he was so utterly, stridently wrong, yet so arrogant that he apparently didn't feel the need to even know what he was lecturing others about makes everything he's written in this otherwise (seemingly) excellent extended essay deeply and sadly suspect. قرأت نصف الكتاب في رحلة و بعدين نسيتو و بعدها بشهرين تقريبا رجعت كملتو.فا معلومات بداية الكتاب ما استحضرها كويس. كتاب صغير تقدر تخلصو في كم ساعة. يستعرض قد ايش الخوف من الطاقة النووية غير منطقي او ما يستاهل الخوف الهائل دا ولا الحملات المكثفة ضدها. يجيب عدد الوفيات و عدد الناس الي اتعرضو للإشعاعات النووية و قد ايش تأثيرها و كم عدد الي اتاثرو و جاهم سرطان او فقر دم. في اكبر حادثتين في عالم الطاقة النووية. تشيرنوبيل في الاتحاد السوفيتي و فوكوشيما في اليابان. حتتفاجاء بالبروباقاندا الي مساويها الاعلا قرأت نصف الكتاب في رحلة و بعدين نسيتو و بعدها بشهرين تقريبا رجعت كملتو.فا معلومات بداية الكتاب ما استحضرها كويس. يستعرض قد ايش الخوف من الطاقة النووية غير منطقي او ما يستاهل الخوف الهائل دا ولا الحملات المكثفة ضدها. يجيب عدد الوفيات و عدد الناس الي اتعرضو للإشعاعات النووية و قد ايش تأثيرها و كم عدد الي اتاثرو و جاهم سرطان او فقر دم. في اكبر حادثتين في عالم الطاقة النووية. تشيرنوبيل في الاتحاد السوفيتي و فوكوشيما في اليابان. حتتفاجاء بالبروباقاندا الي مساويها الاعلام ضد الطاقة النووية. و يتكلم شويا عن التحديات الي تواجه الطاقة النووية من ناحية المخاطر مثل الفضلات النووية و كيفية حفظها و التكنولوجيا الجديدة الي تقريبا تمنع المفاعات النووية من ارتفاع حرارتها و ذوبانها (مثل تشرنوبيل و فوكوشيما) حتى في حالة توقف الكهرباء و التبريد. و يتكلم من ناحية التكلفة ايضا. يستعرض ايضا كيف مستحيل الطاقة الخضراء (الشمسية و الرياح) تغطي استهلاك الشعب و تبطئ الاحتباس الحراري. مرة صعب من غير استعمال الطاقة النووية. While this book is a thought provoking and compelling argument for the use of nuclear power to reduce carbon emissions, I feel that the author damages his case somewhat by minimising the risks of past nuclear accidents. Particularly with the recent revelations about leaks from the Fukushima plant I feel this damages the book's credibility. The argument is surely not that nuclear power is risk free, but that it causes significantly less environmental damage than burning fossil fuel does and there While this book is a thought provoking and compelling argument for the use of nuclear power to reduce carbon emissions, I feel that the author damages his case somewhat by minimising the risks of past nuclear accidents. Particularly with the recent revelations about leaks from the Fukushima plant I feel this damages the book's credibility. The argument is surely not that nuclear power is risk free, but that it causes significantly less environmental damage than burning fossil fuel does and therefore poses considerably less risk to human health in the long run. While media scaremongering has undoubtedly overstated the dangers, to say that a lower percentage of cancers than expected proved fatal does come across as rather dismissive of the suffering caused by the cancers themselves. I would also have appreciated more discussion of the safety of new generation nuclear - while I have no doubt that we could build safer power stations, I am not sure whether regulation and oversight is sufficient to ensure that we do. Here are your choices, world: (1) the extreme effects of global warming, (2) crushing third world poverty, or (3) a renewable+nuclear future. Every alternative has its plusses and minuses, but the minuses of (1) and (2) are so large and destabilizing, it is scary to contemplate. People in Africa, Asia, and Latin America are not "noble savages." People in the developed world are going to want more and more power. What choice is left? The main drawback to (3) is not the potential for terrorism or t Here are your choices, world: (1) the extreme effects of global warming, (2) crushing third world poverty, or (3) a renewable+nuclear future. Every alternative has its plusses and minuses, but the minuses of (1) and (2) are so large and destabilizing, it is scary to contemplate. People in Africa, Asia, and Latin America are not "noble savages." People in the developed world are going to want more and more power. What choice is left? The main drawback to (3) is not the potential for terrorism or the waste storage problem as Lynas points out, but the potential proliferation of weapons grade materials—which he only obliquely references. But, as Lynas does point out, all that means is that nations must comply with the NNPT. A concise and unemotional explanation of how nuclear power should play a bigger role in fighting global warming. The writer uses data to back up nearly all of his arguments (most of that data I plan to cross-reference, as there are some surprising conclusions.) But this is a great examination about an oft-overlooked aspect of the climate change equation. An interesting read. Short but informative. The chapter on nuclear waste was particularly useful as was the information on the two recent disasters (Chernobyl and Fukushima). A useful antidote to much misinformation. Really liked this book, although very short. I find this book a gross oversimplification of a complex issue. It does contain some solid arguments, but flounders as a cohesive piece.